FIGURE 3 Wegener's granulomatosis: cholesteatoma. Wheezing and dyspnea in the setting of WG and chest imaging studies that rule out active lung disease should always raise the question of SGS. The diagnosis should be pursued by nasolaryngoscopy with adequate visualization of the subglottic region (Fig. 4). Ocular involvement may become apparent as eye or orbit pain, visual impairment, diplopia, episcleritis, scleritis, conjunctivitis, uveitis, retinitis, and dacrocystitis. 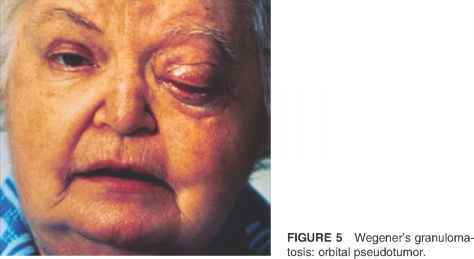 Proptosis due to orbital pseudotumor is present in approximately 15% of cases and is the cause of pain, diplopia, and/or visual loss. Pseudotumor may cause vision loss in approximately 50% of patients that present with this complication (Fig. 5) (7). 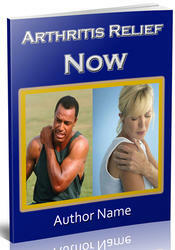 Musculoskeletal disease in WG includes myalgias and migratory arthralgias. Frank arthritis can occur; but pain alone, disproportionate to findings on joint examination, is far more common. Frank myositis is rare. Constitutional symptoms, such as fever, night sweats, and weight loss, may occur with or precede characteristic organ system involvement. Lung disease can present with focal or diffuse infiltrates, nodules that may cavitate, endobronchial stenosis, and pleuritis. Active pulmonary disease may be asymptomatic in up to one-quarter of patients. This is more common in the setting of nodules seen on chest computed tomography. Alveolar hemorrhage is almost always symptomatic and results from small-vessel vasculitis (capillaritis). It can be associated with cough, dyspnea, hemoptysis, and a rapidly falling hematocrit. Diffuse involvement may lead to ventilator dependency. Skin manifestations include palpable purpura from leukocytoclastic vasculitis, livedo reticularis, subcutaneous nodules, vesicles, papules, ulcers, small to large areas of infarction, and gangrene. WG cardiac effects are clinically less apparent. Pericarditis is the most frequent manifestation. Myocarditis and valvular heart disease may also occur. FIGURE 4 Wegener's granulomatosis: subglottic stenosis before (A) and after (B) injection of depocorticosteroids and dilatation. Other less affected sites are the pulmonary arteries, breast, and genital system. WG can affect any anatomic site, although as previously noted, it does have a unique predilection for the airways and kidneys.